The 1987 Buick Regal Grand National, Turbo T, and Regal GNX shine in this edition of Muscle Car Milestones. It’s hard to believe there was a time when Buick actually built some incredible muscle cars. 30 years ago, the Grand National, Turbo T, and GNX were three of the fiercest performance cars you could get during the so-called Malaise Era. That might be difficult to contemplate today, but 30 years ago, it was a reality. Let’s look back and see what made the 1987 turbo trifecta from Buick three of the most revered muscle cars of their time. We all know the early to middle 1980s were not kind to the muscle car. Between the insurance companies and Uncle Sam putting the squeeze on muscle cars a decade prior, performance as we knew it had practically disappeared. But toward the end of the 1980s, things started to change. Horsepower was slowly increasing and the muscle car was slowly making a comeback. And if you asked what car was on the radar of many muscle car aficionados in 1987, the Buick Grand National was probably high on their list. The 1987 Grand National was equipped with a sequential fuel injection 3.8-liter turbocharged V6 mated to a four-speed automatic transmission. This combination was good for 245 horsepower and 355 foot-pounds of torque. 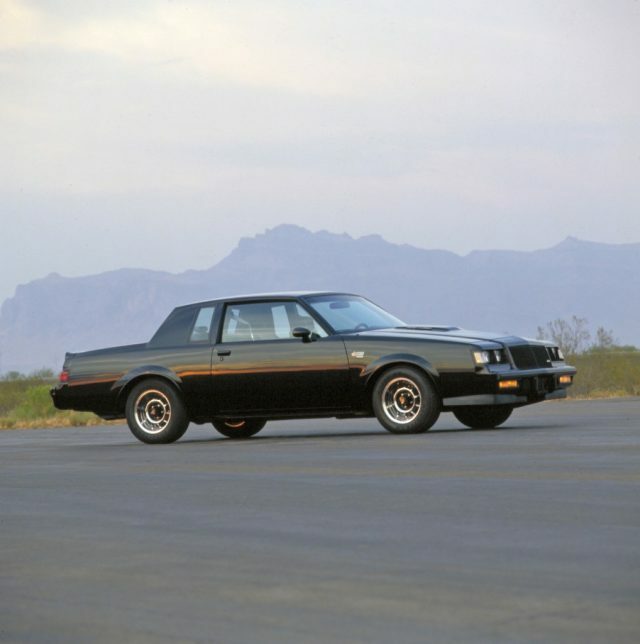 Motor Trend put the Grand National to the test for their August 1987 issue. They achieved a 0 to 60 time of 6.1 seconds and ran the quarter mile in 14.7 seconds with a speed of 95.1 mph. And just in case you’re wondering, the Grand National was just as fast as the Chevrolet Corvette from 0 to 60 and in the quarter mile. Try not to gloat when you mention this to your Corvette buddies. Oh, and don’t forget the Grand National was roughly half the price of the Corvette. With these two factors in mind, most Corvette owners probably cringed seeing a Grand National creeping up in their rear view mirror. The Grand National came standard with an abundance of performance equipment. Some of the highlights include a 3.42 performance axle ratio, performance-tuned Gran Touring suspension, and 15-inch chrome-plated steel wheels. Inside, the driver is greeted by reclining bucket seats, a leather-wrapped steering wheel, and a full-length operating console. Perfect for storing those Whitesnake and Dokken cassettes you like to crank up while cruising through town. You could also get the Grand National in any color you wanted as long as it was black. The Buick Regal Turbo T was marketed as an alternative to those who wanted the look and performance of the Grand National but at a lower price and with slightly reduced weight. The same 3.8-liter SFI turbo V6 with intercooler used by the Grand National was part of the package. Checking off option code WE4 for the Regal Turbo T also got you a car with aluminum wheels, sport mirrors, front spoiler, and “T” fender badging. Inside, the package also included air conditioning, bucket seats with console, tachometer, and turbo boost gauge. According to a 1987 Buick product information bulletin, the Regal Turbo T was created because parts, such as chrome plated wheels and certain interior pieces, place the Grand National in a weight class which is capacity constrained. Sales of the Grand National cannot surpass 33 percent of Regal turbo engine creation. Therefore, 66 percent of turbo sales must be with other Regals. Since the Regal Turbo T was produced solely for the 1987 model year, it’s pretty rare. Production of this rare coupe is reported to be around 1,540 units sold. If the Grand National and Turbo T didn’t satisfy your need for speed, you could step up to the GNX. For around $30,000, you bought bragging rights to a car that could outrun just about any U.S. production car. The GNX was produced in conjunction with ASC/McLaren. The GNX used the same turbocharged 3.8-liter engine as the Turbo T and Grand National but it gained a different Garrett AiResearch turbo, transmission fluid cooler, and a reworked ROM computer chip. The GNX also features Buick-Bosch sequential-port fuel injection and the shape and number of fins in the intercooler have been altered for better performance. And just like the Grand National and Turbo T, the only transmission available for this behemoth is a 4-speed automatic. Since production of the GNX was kept to around 500 units, these are about as rare as hen’s teeth. Autoweek back in February 1987 reported the GNX was capable of 0 to 60 run times of 5.4 seconds and quarter mile runs in 13.3 seconds at 104 mph. That’s half a second faster than the Vette from 0 to 60 and 1.2 seconds faster in the quarter mile. Reviewers knew this car was special and lamented that its time was growing short. Rear wheel drive G-bodies were on their way out at the end of the 1987 model year. They also felt the GNX would be a future classic. Fast forward 30 years and it’s pretty safe to say that prediction is an understatement. Prices for low-mileage examples have pushed the $200,000 mark in recent years. With that in mind, most of these probably don’t see the light of day very much. If you need a crash course in what makes the Grand National special, check out Black Air: The Buick Grand National Documentary. It’s a 70-minute thrill ride taking you through the car’s history as well as a glimpse at the people who helped make this car the legendary icon it has become. It’s available at gnmovie.com. Few muscle cars from the 1980s can be defined as legendary. The 1987 turbo Buicks are one of the few exceptions. Not since the fabled GSXs from the early 1970s has a Buick been more revered. Is it fair to say these turboed Buicks helped bring back the muscle car? That point could be debated but one thing is certain. The 1987 Buick Regal Grand National, Turbo T, and GNX are still three shining stars from a bygone era.